Nissan is using Microsoft's Kinect for Windows technology to sell cars at its dealerships. Through Kinect's Natural User Interface (NUI), Nissan is enabling shoppers to explore a virtual 2013 Pathfinder and explore the SUV—which isn't in showrooms yet—using motion and natural human gestures. When shopping for a new car, more than 71 percent of U.S. consumers use the web to compare brands, choose model and color choices and investigate incentives and financing. Most will use an online vehicle configurator to "build" a customized version of their ideal car. The next step: a trip to the dealership to see the cars in person. "'Kicking the tires' is a critical step in a consumer's car buying process," said Jon Brancheau, vice president, Marketing, Nissan North America, Inc. "But what happens if the dealer doesn't have that "dream car" on the lot, or that car has not been produced yet? How many sales are left on the table when they can't put their customer in the desired car, and make the critical physical connection to close the deal?" Using Kinect's NUI shoppers will be able to examine the 2013 Pathfinder, which is scheduled for worldwide release this fall. Potential buyers can look at the exterior, customize colors, bend down and inspect the wheels, view the front and back, and then step inside to experience the upholstery, legroom, entertainment system, and other details. The program runs from August 20 through the end of November 2012. 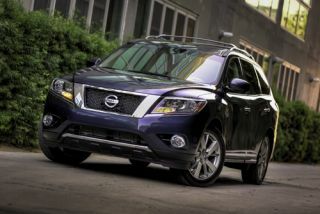 Nissan will roll out the Pathfinder Kinect Experience to 16 Nissan dealerships across 13 states. Each dealer has been outfitted with a Kinect for Windows-based kiosk, a computer, a TV and all the essential hardware and software. Shoppers will follow a tutorial that guides them through an array of natural movements, such as extending their hands, stepping forward and back, as well as leaning from side to side, to activate hotspots on the Pathfinder image projected onto a TV screen. The actions simulate the real-world process of exploring an actual car. The automaker debuted its Kinect for Windows-powered vehicle experience at the 2012 New York and Chicago Auto Shows for the reveal of the newly redesigned Pathfinder. The challenge: there was no physical car to showcase. The solution was to deploy the application on a big screen and allow users to immerse themselves in the car virtually. "Nissan is one of the first automakers to use Kinect for Windows technology in its dealerships. We are committed to driving innovation not only in the design of our vehicles, but also in how we go to market," said Brancheau.